10 Smells Dogs Hate and Why You Must Know Them? 10 Smells Dogs Hate and Why? Dogs are successfully used in rescue operations, tracking missing persons and military bomb squads. These specially trained sniffer dogs use their powerful sense of smell. They are our super heroes! Believe it or not, these days they are even trained to sniff out diseases (a great article) like diabetes and cancer. 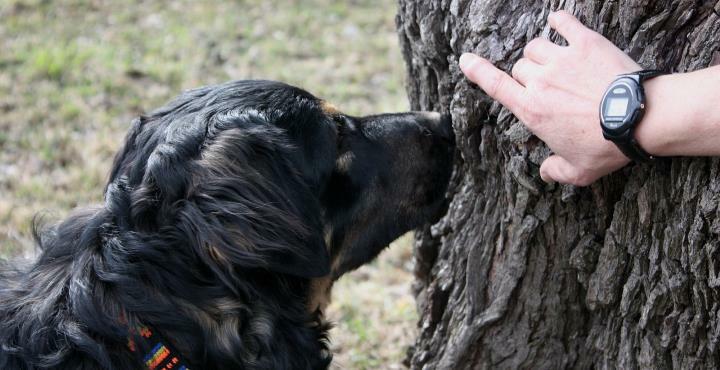 Off course, the reason for the high success rate of canines in such operations is their developed sense of smell. Did you know that a dog’s sense of smell is nearly 40 times greater than humans? And, that’s the reason why things that humans miss out are easily found out by dogs. As a dog owner we know this right? If you haven’t tried, then you can experiment with your pet dog by hiding his favorite treat or toy and then watch him track it down. But at times this highly developed sense of smell of a dog can become a problem for him. Some smells that you love might become unbearable for your furry friend. Some smells dogs hate are that of perfumes, cleaning agents or even some citrus fruits that we commonly use. This abhorrence of dogs to certain smells can be easily used to keep them off gardens, furniture and any other item that you do not want your pet dog to poke his nose in. You can use this knowledge to your advantage and keep your home and garden safe from your inquisitive pet dog. Have you ever tried squeezing an orange peel in front of your pet dog? Well, their reactions can be hilarious to watch to say the least. Dogs run away from anything that smells lemony. This includes limes, lemons, grapefruits and oranges. The citrus smell that might feel refreshing to humans is one of the topmost smells dogs hate. And this fact can be easily used to dissuade our pets from chewing furniture, digging flower beds or urinating inside home. Start by placing peels of any citrus fruit at strategic locations. You will find that your pet dog will start avoiding places where you have placed the fruit’s peels. You can even spray the juice of these fruits on your furniture to prevent your pet from chewing it. By spreading some orange peels along with used coffee grounds on your garden soil you can prevent your pet from digging the garden soil. Additionally, the peels and coffee ground mix will act like a fertilizer for the soil. Essential oils of the various citrus fruits are also available in the market. But, their smell can be a bit too much for your pet and can harm his nostrils and throat. It is better to stick to fresh fruits, but if you really must use the oils then it is better to dilute them with some water before applying them. Apart from its use in cooking and cleaning, Vinegar is also a popular pet repellent. The acrid smell of vinegar is unbearable to dogs and they would do anything to avoid it. But, the smell of vinegar can be a bit strong for humans too and hence we will not recommend using it inside the house. But if you must, then you can dilute vinegar with water and then spray it at the required place like at the leg of a chair. Or you can pour a little vinegar at the location you do not want your pet to be in. Another option is to soak vinegar on cotton balls or old rags and then place them at the required locations. This technique is especially useful when you want to prevent your pet from destroying your garden. Since vinegar should never be poured directly on the soil or plants (as it would kill them), you can place cotton balls soaked in vinegar near your flower beds. This will keep your soil and plants safe from your pets. Pets do not like this smell even when it has dried. As a precaution though, you can re-soak the cotton balls or rags every week to keep the pet away permanently. Chilli powder or pepper powder is commonly used to spice up food. But, for dogs the taste and smell of chilli is absolutely loathsome. The smell of chilli causes irritation in the dog’s nostrils and makes him sneeze. This is the reason why chilli powder is also used as one of the ingredients of natural repellents. But, instead of buying a commercial product you can easily make your own home made pet repellent. Ground the pepper and mix it with water and then use it as a spray. Put crushed pepper near doors or around the legs of tables or chairs. You don’t need to put too much, a little will do the trick. Spread chilli powder near plants and around flower beds. It is also a good idea to dangle a chilli in front of your pet. This will also keep him away for a little while. This is especially useful when you are busy with some work and he is bugging you too much. Just remember that direct contact with chilli can be painful for your pet. You will also need to be careful when there are children around the house. So, try not to put it at places where your kids might touch it accidentally. One of the smells dogs hate is that of rubbing alcohol. This is the reason people prefer to wash their pet’s injuries with just water. It is always better to let a vet disinfect the wound. But you can always use the alcohol as a repellent. What you need to do is just soak some cotton balls in alcohol and place them at strategic locations. Since alcohol wears off after some time it is better to re-soak the cotton balls periodically. This will help keep the smell intact. Other products that dogs hate are alcoholic beverages and antibacterial gels. The strong smell of these products is disliked by dogs and they try their best to keep away from them. Alcoholic beverages can also be toxic for pets. Dogs also hate the smell of certain cosmetic products; nail polish and nail polish remover being the topmost in the list. The alcohol content in these products makes the dogs averse to the smell. These products also contain chemicals like formaldehyde, dibutyl phthalate and toluene. The fumes of certain nail polish can even be toxic. The smell of all these chemicals causes irritation in the nostrils and throat of a dog and that is why he stays away from it. The smell can even make him sneeze and itch. In order to prevent your dog from scratching doors or legs of chair, you can apply some nail polish on the furniture. This will certainly keep him away. Another category of smells dogs hate is the smell of cleaning products. Chlorine based products may cause sneezing in animals. It is better to use these products in well ventilated areas. Spraying these products directly on soils and plants might harm them. Hence, you can also soak cotton balls in these products and place them at the required location. Ammonia based products also have a strong smell and are disliked by dogs. But the verdict on ammonia is divided. Some owners believe that ammonia smell is similar to urine and might make a dog mark his territory in areas where you have used ammonia. Hence, some people discourage using it. These products can be harmful for your pets if they ingest it. Hence, use them cautiously. You can spray them on furniture or use soaked cotton balls. Neem oil is another natural and non-toxic product that you can easily use to dissuade your dog from entering in forbidden areas like flower bed, garbage bins and so on. The smell of neem oil is quite strong and is somewhat similar to the smell of garlic. Since in concentrated form the smell of neem oil can be too strong even for humans, you can use it by diluting it with water. After diluting it you can spray it at specific locations. Neem oil also works to repel insects and mosquitoes. Hence, you can also use it by putting some soaked cotton balls around your garden. Vicks vapo rub is used in colds and to treat nasal congestion in humans. It contains eucalyptus oil and methanol. The smell of these products is too much for the sensitive nose of dog. It causes burning sensation on his nose and makes his eyes water. The dog will do anything to run away from the tingling smell. You can apply a small quantity of this product on places you want to keep safe from your pet. Like nail polish, perfume smell is also one of the smells dogs hate. Though, dogs like natural smell of flowers, the chemicals in the perfumes make dogs averse to them. In order to repel a dog from a particular area you can spray some perfume. The smell will keep your pet away. Naphthalene balls are commonly known as moth balls. People use them to keep pests and insects away from kitchen and bedroom cabinets. But they can be quite dangerous to your pet if he accidentally ingests one. Hence, it is safer to put them at places where your pet cannot reach. Mothballs are also dangerous for children hence use them cautiously if there are kids in the house. If you really need to use them then keep them well covered. You can also put them in some sort of holder. By keeping them in a holder your dog will not have direct access to it. The openings in the holder will let the smell pass which will keep your pet away from that area. It is always better to use natural products to repel your pets. Commercial products or chemicals like ammonia or chlorine are toxic in nature and can cause harm to your pet. The aim is to keep your pet away from certain areas in a way which does not cause undue stress to him. Though we have highlighted the use of the various products above, here are some ways in which you can make your own natural repellent and use it as and when the need arises. You can mix more than 1 smells dogs hate and come up with your homemade repellent. As a spray: Mix orange juice with water or mix chilli powder with water to use it as a spray. You can also add some vinegar to make the spray more effective. In solid form: Mix chilli powder with coffee and sprinkle it on the soil. You can also place some cut citrus fruits pieces on the soil. The list of the smells dogs hate given in the article is a common list. Some dogs may dislike certain smells more than the others. Each dog will have his own likes and dislikes, but you can try working with the given items and find out which smell your pet hates the most. While using the products just remember to not use them directly on your dog. It can cause health problems for him. Just use them at the required places and your pet will keep away from there. You will love this short video from University of Pennsylvania, which shows how they train working dogs to search for things using their powerful sense of smell.